Hello, it's been a while. Some news reaches me from afar that might be of interest to Gillie fans and followers. 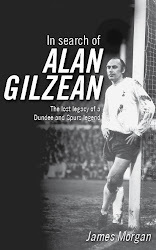 First up, I've heard a rumour that the great man is expected back at White Hart Lane some time this season (courtesy of Steve Perryman's gentle promptings). I can't confirm or deny that one but I do know that it would be a wonderful occasion and I'll certainly be keeping my ear to the ground – I don't want to miss that roar when he finally steps on to the pitch for the first time in decades. The second piece of news is confidential, for now, but this one is concrete and concerns Dundee and something that I focused on – or rather the lack thereof – in the book. Again, I'll provide confirmation when I get the nod. Finally, I have heard and read complaints from some about the price Gillie is currently selling for on Amazon. I've seen upwards of £50 with some online affiliate sites. I'd like to take this opportunity to point out that the book has now gone to a third run in the new, smaller format and can be purchased for the meagre sum of £6.29. Amazon's delivery time claims one to two months but there are books in BackPage Press' warehouse so it should be a considerably quicker process than is claimed.